Would you buy a phone like this? Intel has decided that it wants smartphones to be as powerful as the best in class, and has outed its reference design minimum specification for manufacturers that want to use its chips. To use the Intel Atom processor, the company wants brands to put in elements like a 4.03-inch high resolution screen, an 8MP camera with 1.3Mp front facing option and HD video playback. 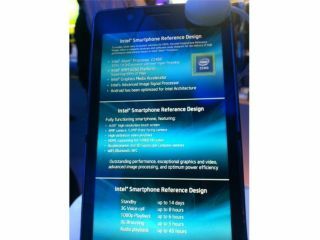 Intel says: "To enable faster time to market solutions for OEMs, the Intel Smartphone Reference design offers a complete hardware and software-ready blueprint for the delivery of high performance smartphones based on the Intel Atom Processor." We're not sure why the company is so oddly specific with items like the display size, but the ability to output full HD video over HDMI and NFC, gyroscopes and Wi-Fi all make perfect sense. These will help deliver 'outstanding performance, exceptional graphics and video and optimum power efficiency' according to Intel. Battery life? You'd better be pushing 6 hours of 1080p playback and 45 hours of audio listening through your phones, else the boys will be round. Intel has struggled hugely in the ARM-dominated smartphone arena over the last few years, but hopes that a new wave of hypersupermegaphones (not actual megaphones, mobile telephones) will help bring it back to the fore, especially now Android has been optimised to work with its chips.